There are many different reasons where a paddler needs to be towed. A few of the reasons can be injury, sickness, fatigue, picture taking, lost paddle (you should have had a spare) or cannot keep up with the group. Towing also has a nasty stigma attached to it called "failure", which inhibits more frequent use of the tow rope. Please see published article "Team Towing" (on the USK web site) that discusses these issues. Since I have guided hundreds of groups I have had more than my fair share of towing opportunities. There are many towing methods and configurations. When a paddler needs to be stabilized while being towed, my preferred towing method is one kayak towing two kayaks. You may think that one towing two is a lot of work, but once you give it a try I think you will be surprised. It is very common to hear from students in towing clinics say, "it wasn't nearly as hard as I thought it would be." Anytime you tow another you are working harder than paddling just your own kayak. However, I have been on trips where one has towed two kayaks for six to ten miles and the group stayed together without the towers falling behind. I suggest you give it a try to see for yourself. Also, if you only have three in a group you may not have any other alternative. 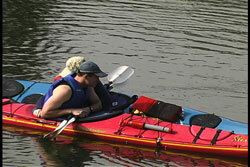 The main reason two paddlers need to be towed is one of the towees cannot remain upright on their own. A second paddler needs to stabilize the other. Most often I have encountered this with a very seasick paddler who needs to be stabilized, because they are so dizzy they could capsize if they were not held upright. The person I get to stabilize the unstable boater is usually the weakest of the remaining paddlers. This way I have stronger paddlers ready to help if I need it. 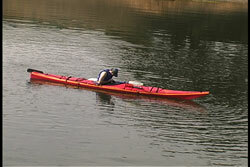 However, I once used my strongest paddler and we switched the stabilizing position every 30 minutes. This way each of us had a 30 minute rest period. Your decision as to who will tow should be based on your resources, environmental conditions, towing distance and time available. Even though we say we have one-towing-two it is really one-towing-one with the second kayaker (the stabilizer) hanging on to the kayak being towed going for a ride. I think this is an important distinction to make, which we will discuss in more detail later. Our pictures and discussion will use the seasick paddler as an example. We noticed our seasick paddler and established they cannot continue on their own and they need to be towed and stabilized. (See USK article, "The Seasick Paddler") If you are in a group situation, this is when the group gets together to discuss the possibilities. Keep in mind that the person who is sick does not want to be sitting still for very long. In addition, they are not liking the idea that they are the topic of conversation. The embarrassment is another issue that accompanies the physical feeling of being ill or injured. If you know your group, a towing scenario could have already been decided before the trip leaves the beach. In club trips, where many know each other and the individual skill levels of the group, a towing team could be set up on the beach before leaving. One of the discussions before leaving a beach, with a group, is identifying your resources such as: tow ropes, radios, extra paddles, first aid kits, repair kits and that everyone has water to stay hydrated during the trip. During the pre-launch discussion you could also decide who will start the towing if a tow is needed during the day. Of course the person designated to do the towing should have their tow system readily available. 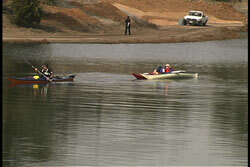 In this case the stabilizing paddler has taken a position parallel to the sick paddler. They decided to let the sick paddler lean over the two paddles, being used as a bridge, for a greater sense of stability. This can also be done without the paddle bridge. 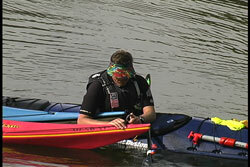 The assisting paddler lays across the second kayak and holds the cockpit coaming on each side for additional stability. It is important for the assisting paddler to fully rest on the sick paddler's boat so their own kayak is more on edge which streamlines the towing process. There are a number of reasons for resting behind the sick paddler rather than in front of them. Aside from the obvious reason of not wanting to be in front of a sick person, I personally find I am more comfortable on the back deck and I have greater control of both kayaks. When I am doing the stabilizing, it is my responsibility to keep my kayak on edge with my bow close to the disabled kayak to give the least amount of resistance for towing . If the two bows of the boats being towed move apart, it increases the resistance, which means more energy expended by the person(s) doing the towing. If the two bows are together they look like this ">", which is more streamlined. It is pulling a "V" by the point. If the bows are apart they look like this "<", which is pulling a "V" with the open end leading. The most difficult part of doing the stabilizing is keeping your kayak close to the kayak being towed. Hanging on is relatively easy, because you are resting on the other kayak. It is more difficult if you just try to hold the kayak with your hands and sit upright. One of the devices that I have seen used is called a "Deck Sling". See USK article "Deck Sling." I have also heard it referred to as a "Paddle Park", but I prefer deck sling. The deck sling has many purposes that can be discussed in a future article. The deck sling has a clip on each end of a rope or webbing 60 - 64 inches long. The length depends on the width from port deck line to starboard deck line and how loose you wish to keep it. The deck sling is under both deck lines and then the ends are clipped to the opposite deck line. In this case I have unclipped the sling from my deck line and then attached it to the deck line on the kayak that is next to me, which is representing the unstable kayak that is being towed. My deck sling will help keep us together. Using the deck sling means I expend less energy trying to keep the two bows from moving apart while the kayaks are being pulled forward. Here is another opportunity for me to get on my soap box regarding the virtues and necessity of having deck lines on all kayaks. Deck lines are mostly used by those who have to help you. If you want to be helped, it would be nice to make it as easy for the person helping you. If you do not have deck lines, install them! Keeping the kayaks together can take a lot of work if you do not develop good techniques. 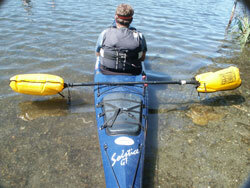 In this example you can see how much the stabilizer is edging their kayak to keep the kayaks together. Their kayak has a white hull which you see is very much exposed, because they are laying on the back deck of the unstable kayak. When resting on the back deck, you use your outside knee/thigh (under the coaming) to pull your bow (and hold it) against the kayak you are resting upon. Again, the closer you keep your bow to the bow of the other kayak the less work you have to do and the less resistance you create making it easier for the one doing the towing. You will also be using your abdominal muscles to hold your bow close to the kayak you are assisting. So When I say "resting" on the kayak that is being towed, you are far from resting. You are using the towed kayak for support, but you are expending energy with you body to stabilize and hold the bows close together. I find the more I edge my kayak the more easier it is for me to manipulate and control the position of my bow. Once the unstable kayaker is being stabilized, it is time to get towed. The one doing the towing goes to the bow to clip in. See USK article "Clipping In For A Tow." As you will read in the referenced article, there are many different towing clips and places to clip onto depending on the kayak. This is a good time to mention that the strength of the tow rope is rarely a concern. It is the strength of the attachment point you need to worry about. Grab loops and deck lines that are old and worn out due to the elements are the weak link in the chain. That is why you need to replace rigging regularly. 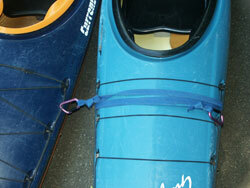 See USK article, "Spring Cleaning My Kayaking Equipment." I only clip onto the kayak of the sea sick paddler. I do not like attaching the stabilizer's kayak to the tow line, because I want them to be able to disengage without having to wait for someone to unclip them. I will admit that running the tow line through the stabilizers front rigging makes it easier for keeping the kayaks together when towed. However, the loss of freedom for the stabilizer is not worth it in my opinion. Unless I am the one being towed, I do not like being held to a tow line that is out of my reach, because I want to be able to move as needed. After you have chosen your attachment point, position your tow belt to allow the line to play out as you paddle forward. Once the line is totally out, the resistance from the towee usually positions the tow belt with the line behind you. The belt needs to be loose enough to allow the belt to slide around your waist. Since I used the word "belt" it should be obvious my towing system is on a waist belt. There are many different towing systems out there. I am a very strong advocate of using waist tow belts in group situations, because it allows for easy transfer of the tow belt from person to person. A quick release belt, for my towing system, is essential for many reasons. Being able to quickly disconnect from a tow line is an important safety feature. When I need to relinquish the towing to another paddler my quick release tow belt allows a very efficient transfer. I just open the belt buckle and hand the tow belt to the next paddler who plans to do the towing. Deck mounted tow systems may not allow the versatility needed unless everyone in the group has the same system. While I prefer to tow with the cow tail system on my PFD, because of the comfort provided by the PFD, it does not transfer from person to person. As with any tow, you will be working harder until you get the boat(s) up to speed. Once the boats are moving it takes a lot less energy to keep them moving. An elastic shock cord attached somewhere along the tow rope greatly reduces any jerking feeling. When you find your rhythm stick to it. As I mentioned earlier, one-towing-two is not as strenuous as people would think. When you look at other towing configurations that require more people towing the orchestration of the towers takes longer and takes more communication. If there are only three of us, I can let the two kayaks glide up to me after I stop. Then I can assume the stabilizing position and hand the tow belt off to the other paddler who was stabilizing and resting for the last leg. I usually recommend 30 minute legs. If there are morethan three in the group, the person stabilizing would move up to the towing position, because they are coming off of their rest break. 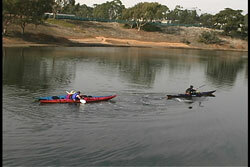 The you can rotate the others in the group into the stabilizing position to get their paddling break before they start towing. This way the towing is done by many thus sharing the energy output. If you are a guide and/or only like to paddle with one other paddler, then you need to think about some other ways to stabilize the unstable paddler. The use of "Sea Wings is a wonderful alternative. See USK article "Sea Wings Recoveries and Uses." Here we have one-towing-one with the unstable kayak being kept upright by the use of sea wings. I like sea wings over using two paddle floats on a paddle because the sea wings seem to cause less resistance of the two. If you do use a paddle under the elastic deck lines with a paddle float on each end, expect to have the shaft moving around under the lines unless you secure the paddle really well. When the seasick paddle leans from side to side, the paddle float that touches the water sometimes causes the kayak being towed to veer off course. We can see the seasick paddler leaning forward while being towed. 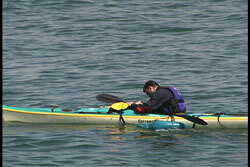 The stability provided, in this case is from the sea wings, along each side of the kayak increases the beam of the kayak thus adding stability. Keep in mind that sea wings are not capsize proof. One can still go over if the unstable paddler leans too far to the side. These two examples of using floatation aides for stabilizing a paddler are only alternatives to be used if you do not have another paddler to help you stabilize the unstable paddler's kayak. Keep in mind the unstable paddler can still capsize with these floatation aides if they lean to far. They are probably best used if the paddler being towed is only mildly dizzy. If the paddler were very unstable I would probably use a contact tow which is another towing possibility. See USK article, "Contact Towing." It is nice to have alternatives when challenges come your way. Towing a disabled paddler that cannot keep upright on their own can be managed without too much difficulty, if you have the right equipment, enough paddlers and have practiced the skill before it was a necessity. I suggest you get three friends and have a practice towing day. First begin with two pairs doing a one-on-one tow. Then rotate through a one-on-two tow. It is important to assume each part of the one-on-two configuration to help you better understand the dynamics in each position by actually experiencing it. While you are out during towing practice I also suggest you try other towing variations such as: two-towing-two in the "V" formation and the "line" formation. If you have time try the double outrigger with the paddle and two paddle floats. See what happens when the paddler being towed leans from side to side. 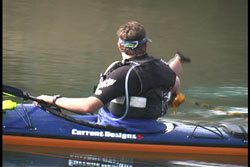 Here is another good reason why every paddler should carry a paddle float. This way any two paddlers can make the double outrigger. Since towing is usually associated with failure or emergencies it is usually not used until the last moment. I disagree with this attitude as I have referenced earlier with my "Team Towing" article. Towing is a way to share energy. It turns two singles into a double with the stronger paddler in the lead. Why wait until a paddler's pain is unbearable before using a tow. If tow ropes were used sooner, I believe it would be easier for everyone in the group. Imagine how much easier a tow would be if the person being towed could help by paddling gently. If a sore wrist were caught early, then the person being towed could probably still help without causing further injury because they were paddling lightly. If you wait until they cannot go any longer, then the person towing is doing all of the work. Above all remember, you cannot use a tow rope unless you bring one along. When you go out, even solo, have a tow rope along.